The rule of the Governor of Meshed should extend north-west by south-east from Abbassabad to Toorbut-e Shaik Jam, and from the border of Koordistaun, on the north, to Tubbus south; but the chieftains of Persian Khorassaun have ever been more studious to preserve the balance of power among themselves than to honour the Shah’s authority; and Meerza Mousa had enough to do to sustain the Prince at all at Meshed, by playing one chief against another. In 1828, Mohummud Khan Kara-e, of Toorbut-e Hyderah, ejected Hossein Khan (the Shah’s sirdar) by stratagem, and kept the city of Meshed for six months; spoiling the place, and levying heavy fines upon the inhabitants; and shortly before our arrival Seid Mohummud Khan, chief of the strong mountain fortress of Kelat, had (though nominally a Sheah) leagued with the Toorkmuns, and kept the holy city in a state of blockade, until he was luckily killed by a swivel ball, in an encounter with some of the Koord chief’s men. The tribes of Persian Khorassaun have hitherto preserved an equality, by making common cause to weaken the power of any one who showed a desire to raise himself above his neighbours; but the Koords have of late years become so formidable, that it may be questioned whether they will not retain their ascendancy. 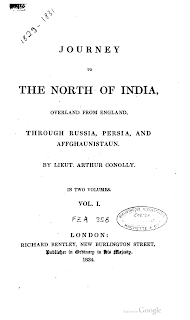 In Fraser’s interesting account of his journey from Meshed to Astrabad through the Koord country, may be read the history of this people: the greatest of their chiefs is Reza Kouli Khan, who, allied by marriage with the other lord, Nujjuf Allee Khan, and on terms of great friendship with the descendants of Begler Khan, late a Koord chief of note, has rendered himself the most influential man in Khorassaun. His country is a fine one, and he therefore pays sufficient homage to the Shah to prevent its being visited by a royal army; and, having withdrawn himself in a great measure from the other chiefs, he generally finds it his interest to take part with the Prince of Meshed. The country between Meshed and Heraut may be shortly described. A little eastward of the south of Meshed there is a considerable fall, and I am inclined to think a break in the Elborz, or, as they may now be called, Paropamisan mountains, which shortly after bend down to a point eight miles east of Heraut, and then I imagine turn easterly to meet the Hindoo Koosh. A small branch runs down from about Shereefabad, in the main range, to the south of Heraut, which is useful in describing the political divisions of the country; for, though for two-thirds of the distance to Heraut it nominally belongs to Futteh Allee Shah, that monarch is not able to control the tribes who occupy it. To the west of the centre of this range is Toorbut-e-Hyderah, a town which, once much larger, now numbers, perhaps, from six to eight hundred houses. It is the seat of Mohummud Khan, of the Kara, or black tribe, a set of marauders who are well named. Their province extends from Shereefabad, on the north, to a place called Danial, four marches south of the capital: on the west it touches the “sirhud” of the province of Toorshish, and eastward it is bounded by the small range above mentioned. The country is naturally a fine one, and in the time of Ishauk Khan (the father of the present chief) it was tolerably well cultivated, and afforded pasture to so many sheep, that it is said some fourteen hundred dogs were kept to watch them;1 but now, as Mohummud Khan is continually aggressing some one, who (according to the mode of retaliation in these countries) endeavours to lay waste his lands, and as, by plundering merchants and travelers, he has nearly shut the once great road through his country, his people have little inducement to raise more grain than suffices for their own consumption, and the cultivation of that is carried on near to Toorbut. The Persians, who seldom use the Khan’s name without cursing it, say that he has sold fifty thousand persons to the Toorkmuns during his rule; and the few travelers whom necessity takes his way go Tewokul be Khoda, specially trusting in Providence, and resigned to all chances. Some years since, a very large kafilah, travelling as they supposed securely under the patronage of Meerza Abdool Wahab, Moatimood-dowlah, one of the greatest ministers that has been known in the present reign, and who had been specially sent by the Shah to put Khorassaun in order, were resting at Toorbut on their way to Meshed, when the Khan laid hands upon them all, appropriated the goods and the beasts of burden, and either took ransom for the merchants and travellers, or sold them to the Toorkmns. The chief’s extenuators say that he was prompted to this lawless life when his father, Ishauk Khan, was murdered by Prince Wullee Mohummud Meerza, the Governor of Meshed in 1815; but as he has turned his spite upon unoffending persons, to his own great profit, this may be doubted. The Shah hates the very mention of Mohummud Khan’s name: when his son, Prince Hussan Allee Meerza, was ruler of Khorassaun,2 his Majesty wrote, desiring him to seize the Toorbut chief, and either to kill or blind him, or send him to the capital. Hussan Allee Meerza did catch Mohummud Khan, but in one of those wild freaks for which he is famous, instead of killing his prisoner, he made mockery of him, by stripping him nearly naked, smearing his beard with curds, and exposing him bareheaded in the sun to the derision of the royal troops. The strangest part of the story remains yet to be told: when the Prince had heaped all these indignities upon his captive, he ordered him into his presence, and, putting the Shah’s firman into his hand, desired him to decide his own fate. Mohummud Khan, by a clever appeal to Hussan Allee Meerza’s generosity, not only turned away his wrath, but induced him suddenly to become as lavish of his favours as he had been of his injuries; when the Khan came out from audience, it was with a jeweled sword belted over a “dress which the Prince had worn,” and the next thing that Hussan Allee Meerza did was, to go to Toorbut and marry the chief’s sister. Mohummud Khan, probably thinking that the Prince’s injuries and favours nearly balanced each other, was not restrained from his former courses, and he has since set the Shah, his governors, and everybody else, at nought. I asked a Jew of Meshed what sort of looking man he was. “I can tell you,” he said, “for when he took this city, he sent for me to make me pay money (God knows the Jews have little enough of it, least of all those at Meshed). The Khan was a thick-set man, and he sat leaning forward, with his cap drawn down his forehead close to his eyebrows, looking hard at those who were brought before him. No man could stand his gaze. The greater part of his eyes was white, like a Hubbushee’s,3 but the middle was black, ― black, I bed to state, as his heart, and that is as black as a pot.” Mohummud Khan must now be a well-aged man; when he dies, or if the long talked-of settlement of Persian Khorassaun takes place, his country will probably recover itself. 1) Seven hundred muns of flour, it is said, were daily made into bread for these dogs: each dog would eat half a mun daily, and tend one hundred sheep, which supposes one hundred and forty thousand of the latter animals; these were said to belong exclusively to the Khan. Exaggerated as the story is, it shows that very many sheep were pastured in the province. 2) Hussan Allee meerza was sent to take the place of his brother Mohummud Wullee Meerza.